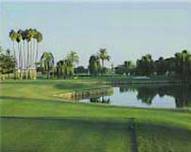 Just as in the section for golf courses available in the Marbella and Benahavis ares, Estepona is also well represented with golf courses. 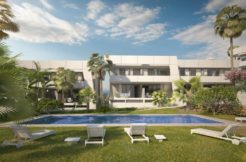 In this section, we will acquaint you with some of the best Golf Clubs in Estepona, located in close proximity to the properties we have on offer. 18-hole championship golf course, designed by world-renowned architect golf courses, Mr. Cabell Robinson, who worked for many years at the Robert Trent Jones Group. 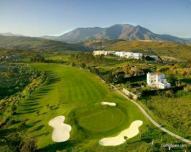 Golf course Finca Cortesin (Finca Cortesin) simply impressive! Its main feature is the length of the field – 6808 meters and a wide variety of vegetation, including olive trees and cork oaks. This unique golf course offers a wide range of holes and bumps, making the game more exciting. Technical characteristics of the field: wide fairways (Bermuda grass 419 to 50 m.), Beautifully shaped bunkers of sand white marble, high quality “ti” stands (each hole has a few “minute”, so the player will always find them in great shape), perfect manicured greens (grass L93 Agrostis), and this is just one of the features of Puukko Cortesin. Golf Club is also proud of the fact that for the past three years, starting in 2009, the club was elected to the world-famous championship VOLVO World Macth Play Championship, which involved 16 of the best players in the world. 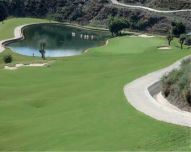 One of the new and beautiful golf courses on the Costa del Sol with sea views in Estepona. 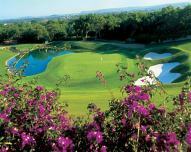 This 18-hole golf course of championship class, ideal for the most challenging and prestigious tournaments. Beautifully designed and offers easy game for beginners golf lovers and smoothly into the complex schemes for professionals. Field covers an area of ​​60 hectares and a length of 5 km to the highest quality standards. Large greens, several options for combining wells and transmission field, averaging 5 launch sites per well. This golf course is more than just a box of good quality and design, it has all the necessary parameters to one day become legendary. Valle Romano Golf Club also boasts a fully equipped club house: shop, restaurant, locker rooms with sauna and a Golf Academy and practice ground for the lighting, where learning is a pleasure! Holes: 18 Par: 72 Designer: Cambell B. Robinson. 18 hole golf course on the territory of the hilly Spanish countryside. Estepona Golf has earned a reputation for well-designed, perfect golf course with wide fairways and tee-pads, as well as greens, which are the envy of most other clubs in the south of Spain. So consider not only we, but also many of the players who the club have a reputation of high level of customer service and great value for money! Estepona Golf has stunning views of the sea, and offers an exciting game and a good test for players of different skill levels. Ideal surface zones putting, characterized by a very strong par 3, including a difficult 14 hole, beautifully Inscribed on the background the mountain range of the Sierra Bermeja. Tempting and 10 hole par 4, where the green is almost surrounded by water, being only 250 meters from the tee area on a hill can be easily played by middle piece of iron – but many brave souls are lured out to go for it! Real Golf Club in Sotogrande (Sotogrande) located on the ground, first used as a golf course, close to the coast between the river Guadiaro and Sotogrande Port. This is the first golf course in Europe designed by Robert Trent Jones was discovered in 1964. “Sotogrande Old”, as the locals call it, boasts a wealth of diverse vegetation: pine trees, cork oaks, eucalyptus and giant palm trees rise above the natural beauty of the surroundings and a well-kept golf course. 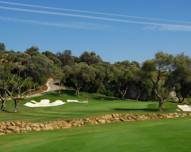 Sotogrande Golf Club is considered one of the top 10 clubs in Europe. Golf championship class, whose length is 6356 meters. According to many critics and leading golfers, has the best fairways in Europe, if not the world. Rather complex field intended profissionalov and designed in such a way as to make you think about the accuracy of each stroke. Valderrama Golf Club host the championships Volvo Masters, which celebrated the 20th anniversary of the longest sponsorship in European golf. In 1999 and 2000, Valderrama took the first two rounds of the World Championship of Golf – American Express Championship, won by Tiger Woods and Mike Wei. To date, Valderrama remains the only club ever to make important golf tournaments United States and Britain, which took place outside their traditional places. La Finca de Marbella 2 Townhouses, Marbella. First line beach Property La Morera, Marbella.